In that vein, I will be taking the next two weeks off writing and will resume on 5 January 2010. Special thanks to those who have commented on specific topics and kept those fantastic exchanges going in 2009. As much as it is good to have many readers, its the comments and questions that I treasure most. The website exists primarily to encourage non-partisan dialogue and perspectives on Zambia. May we continue that spirit in 2010. Wishing you a wonder Xmas and fantastic 2010!! May Lord keep you safe and secure during the festive period. On aid and economic justice..
A shorter version of the Dead Aid review appears in the latest DFID Development Insights Magazine - see page 19. [Full version here]. The review of Economic Justice in A Fair World appears in the Business Economist Magazine. The study finds that the gains from living in a game management area and from active participation in natural resource management are large but unevenly distributed. Only game management areas near Kasanka, Lavushi, Isangano, and South Luangwa national parks in the sample show significant benefits to general and participating households. And in those areas, the poor do not seem to gain even when they participate actively. More even distribution of gains from game management areas across households near different park systems and across the poor and the non-poor should be a continuing goal of national policy makers. The paper does not explain how such "even distribution of gains" may be attained. It seems obvious that two things must at least be part of the solution. First, tackling corruption in Zambia Wildlife Authority (ZAWA) - see previous discussions here, here , here and here. Secondly, the revenue sharing mechanism could be reviewed with greater focus on infrastructure spend which would have a wider benefit to residents. In that sense, infrastructure would provide a minimum floor of benefits for the people. This of course is easier said than done within the current corrupt operational framework of ZAWA. An added complication is that such an approach may also require pooling of resources across Community Resource Boards - not an easy task and likely to face opposition. What is the binding constraint on Africa's trade? Africa’s weak exports are partly due to poor trade infrastructure. Hummels (2001) and Djankov, Freund, and Pham (2010) show that trade delays reduce exports, and that the effect is larger than tariffs. This effect is especially strong in Africa where trade facilitation – the speed of trade – is slowest (Portugal-Perez and Wilson 2009). In recent research (Freund and Rocha 2009), we build on these findings and ask what are the key causes of these trade delays? We use detailed data from the World Bank’s 'Doing Business' report, which provides information on the average time it takes for an exporter to complete a series of procedures when moving their goods from the principal city to the port of exit. Each procedure is classified into one of three main categories: documentation, inland transportation, and customs and ports (see Figure 1). It is clear that getting a product from factory to border control is far longer for Sub-Saharan Africa. Across regions, documentation procedures are the most time consuming. 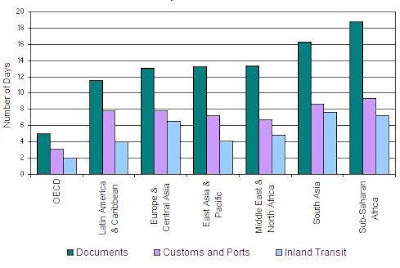 But within Sub-Saharan Africa, documentation procedures take nearly four times longer than developed countries, while customs and ports procedures and inland transit take three times longer. As the backbone of our investigation, we use the gravity equation (this describes aggregate bilateral trade as a function of the size of two countries and the distance between them). After controlling for “gravity” these and other standard determinants of trade, we include our variables of interest: documentation, inland transit, and customs and ports delays. A concern with this approach is that the volume of trade may directly affect trade costs. The marginal value of investment in trade facilitation is higher when the trade volume is large since cost savings are passed on to a larger quantity of goods. Thus, while more efficient trade facilitation stimulates trade, trade is also likely to generate improved trade facilitation. To control for this possibility of reverse causality, we investigate the effects that documentation, inland transport, and customs and ports times have on the exports of new products in the years 2005 to 2007. The intuition is that trade in new goods cannot affect the quality of trade facilitation infrastructure or the bureaucracy that is in place for exporting. As a further robustness check, we use an instrumental variables approach to examine the effect of time-trade costs in transit countries on the exports of landlocked countries. Finally, we estimate a “difference-in-difference” regression on a sub-sample of agricultural products to show how inland transit costs affect exports of time-sensitive goods – ranging from perishable products where time is most critical relative to preserved goods such as tinned food where timeliness is much less of an issue. Increases exports of new products by 7%. Is equivalent to about a 2% increase in all importing tariffs. Why does transit matter more? One explanation for the dominance of transit time is that it is highly variable in African countries, and there is little that can be done to mitigate the uncertainty. Following up on this point, we investigate the impact of uncertainty related with each component of export delays. In particular, we look at whether they can explain why inland-transit delays are more important than waiting times in documentation procedures, or customs and ports procedures. Specifically, we define “time uncertainty” as the difference between the maximum time and the average time it takes to conclude each of the different phases representing the total time to export. Our results show that only uncertainty in road transport has a negative and significant effect on exports. Uncertainty in documentation times may be less important because in many cases documents can be prepared in advance. In addition, while exporters may be able to pay at the port to get things out more quickly when necessary, nothing can be done on the road. Is it all about geography? One possible interpretation of this finding is that transit time is picking up geography. It might be that trade is simply lower when economic centres are far from ports, in which case there is little a country can do to improve things. We estimate the effect of inland transit on exports, controlling for the distance in kilometres from the principal city to the port of export as well as for total travel times. The results of this exercise show that geography is not the primary reason for long delays in transit times. There are other factors that are more important – such as the quality of the roads, quality of the vehicles, likelihood of accidents, theft, competition in trucking, road blocks, and waiting times at borders. Our results have important policy implications. We argue that a focus on foreign trade policy is misguided. The tariffs that African exporters face are already at a very low level and many African countries actually have preferential access to markets such as the US and the EU. As a result, the benefits from a further decrease in tariffs among trading partners is small on average, and may even be negative for countries facing preference erosion. Our results instead point to improvements in inland transit as key to stimulating Africa’s exports. In particular, the focus should be on Sub-Saharan Africa's road systems – especially the infrastructure aspects, the security aspects, and policies that improve competition in trucking. While improvements in ports and customs and less bureaucracy will help exporters, the impact of improved inland transit is roughly five times greater. Djankov, Simeon, Caroline Freund and Cong S Pham (2010), "Trading on Time", forthcoming Review of Economics and Statistics. Freund, Caroline and Nadia Rocha (2009), “What Constrains Africa’s Exports?”, forthcoming as a World Bank Working Paper. Hummels, David (2001), "Time as a Trade Barrier", GTAP Working Papers 1152, Centre for Global Trade Analysis, Department of Agricultural Economics, Purdue University. Portugal-Perez, Alberto and John Wilson (2008), “Trade costs in Africa: barriers and opportunities for reform”, World Bank Policy research working paper N. 4719. A new website for ZAMBEEF. Mufulira district has received K1.8 bn in Constituency Development Fund for implementing various "developmental projects". It is hoped that part of the CDF fund will go towards the repair of the Sabina - Kitwe road which is in a "deplorable state and requires urgent attention". Kasama residents this week stormed Radio Mano over alleged rampant misuse of funds at the community station by its board and management. The residents claimed that over K15 million meant for the radio station has been diverted for personal gain by some management staff at the institution. More detail via this ZANIS article. Another peak at the global copper prices reveals a clear upward trend. We have now reached the copper price level at which President Mwanawasa introduced the windfall tax (in January 2008). Meanwhile, pressure continues to grow on the Banda government. The people want to see the Mwanawasa fiscal regime restored - the latest to join the rally call is Dr Mbita Chitala. Either we see change in this area or we all concede the mining companies have dribbled the people through state machinery. A defence of the current mining taxation regime from Finance Minister Musokotwane : "If we impose tax on revenue on old mines they will end up closing and we don't want to head in that direction. We don't want to create job losses". “Government should reconsider the decision they made on windfall tax, the same way they changed their minds concerning the mineral royalty"
Given Lubinda. The formation of the UPND-PF pact has given Given Lubinda a much stronger platform to emerge as a credible voice of reason on the current political platform. He has been active with many conferences and has been instrumental in presenting a united front. Going forward Lubinda stands a good chance of being a key figure if the Pact were to form government. Saviour Chishimba. The honorary medical doctorate is not enough to save his political career. Dr Chishimba misjudged the public's appetite for new parties. He has found himself saddled with a one man party and without prospect of a parliamentary seat in 2011 or beyond. The shock resignation of George Mpombo as Defence Minister and Chairman of Energy sent shock waves in MMD, which are still reverberating. The famous Presidential press conference full tirade of rants culminating in a request for the police to arrest members of the Post for bringing to government's attention pictures of a woman in labour. It also qualifies as the most expensive rant because it spawned a court case which brought disgrace and a waste of tax payers money. The Dora Siliya scandal. It is remarkable that despite being found to have breached so many things she was reinstated because she did not apparently "breach the constitution". Don't complain, we all have governments we deserve. The abuse of tax payers fund by sending ministers and chiefs for treatment. It appears Zambians have accepted that indeed some lives are worth more than others. The constant reports over the MMD convention have been over the top. The outcome is certain but yet it occupies our many pages. Then there's President Banda's many foreign trips... should I go on? Abolishing the Task Force on Plunder. It was a bad idea from the beginning and in the end it cost us too much money with zero output. Abolishing it was money saved. Formation of the PF - UPND pact. The UPND was on a verge of extinction, but in an era of tribal alliances it was still bold for them to choose a better and more credible path. Zambia has only got space for two parties. The North - South Project is a wonderful idea. RP Capital valuation of ZAMTEL. Day light robbery, with the outcome fully determined. The late Hon Tetamashimba. He'll be missed by foes and friends alike. The "RP Capital valuation of ZAMTEL". The definition of an Oxymoron. Pete Henriott of the JCTR. You can trust him to call a spade a spade. He has tried to do just that throughout the year. Political NGOs (PONGOs) and Government NGOS (GONGOs). A number of these have sprang up, with no vision or any ounce of intelligence. They constantly issue statements which are paraded by uninformed reports as gospel. Local stations. We have seen local community radio stations take a prominent role in shaping debate. I believe their role in shaping political outcomes in 2011 should not be underestimated. Zambia Diaspora Connect : Perhaps I am being biased, but no group has done more for the Diaspora than ZDC. This year they successfully lobbied heavily for dual citizenship and the Diaspora desk. The challenge for the diaspora is how to solve the "collective action" problem given the incentive to free ride. ZDC appears to have successfully done that and in the process are putting the diaspora on a better footing with Zambians at home. ZIPPA : They continue to put out wonderful journals out which have been a great source for many issues we discuss. Its not easy having a credible think tank in Zambia, but with ZIPPA and JCTR we have two sources who may come from opposite spectrum but in their different ways are moving the country forward intellectually. Fr Frank Bwalya. Yes he lost his job at Radio Icengelo, but his energy and enthusiasm remains undiminished. We need more voices like his in our country who will stand for truth, liberty and justice. Rev Shikapwasha (Information Minister). It is so easy to forget the man is a Reverend given the many dangerous statements he continues to make, not least the constantly peddling to untruth. 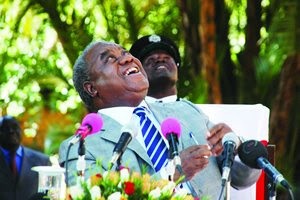 The MMD will hold a convention in 2010 and will elect President Banda. This will undoubtedly split MMD and lead to a new party allied with Mulipi and co. The pressure for the windfall tax will become too difficult for President Banda to resist. In 2010 it will be back on the table. Globally, the world economy will once again enter into recession mode towards the back of 2010 as the stimulus packages wear off. The new recession will take a while to recover, as some governments will simply have no new cash to inject. 2010 is not a time for people to overspend. First, to complete the current book I am working on Zambia. Second, to finish our now two year long blog specials on chiefs over at the House of Chiefs. During the 1960s, we harbored very high and somewhat unrealistic expectations about the socio-economic prospects of our beloved country, Zambia. Equating independence with not only self-rule, but also with genuine democracy and prosperity, we strongly believed that the transfer of political power from colonial to Zambian hands would create greater opportunities for us to enhance our socio-economic well-being. Stuck at a political, social and economic cul-de-sac, Zambia seemed to be heading to calamity when the ripples of democratization and freedom from Eastern Europe reached the country. Taking advantage of the new wind of change, the resilient Zambian civil society got out of hibernation and implored the UNIP administration to liberalize the country’s political system. Again, Zambians reconnected with expectations in 1991 when they voted for the MMD to rule the country. But, once again, the renewed sense of hope has been waning rapidly over the years due to the realization that it takes more than a multi-party system to redress decades of socio-economic decay and backwardness. But how could a country that is endowed with abundant natural and human resources find itself in a predicament whereby 64% of its citizens are wallowing in abject poverty? Te answer lies in what may be referred to as the “leadership problematique.” The need for a new cadre of leaders in Zambia is, therefore, overdue—leaders who understand the Gordian knot of the country’s plight and are in a hurry to move it forward in huge strides in order to change its current trajectory. Let us consider a classification of nation-states paraphrased from a multitude of literary sources to determine Zambia’s current status. The sources include: Amoako, K.Y., “Governance for a Progressing Africa: Opening Statement at the Second Africa Governance Forum,” Accra, Ghana, June 25, 1998; and Kyambalesa, H., “The 27th Ordinary Summit of SADC,” a Press Release prepared for Heads of State and Government who attended the 27th Ordinary Summit of SADC in Lusaka, Zambia between August 10 and 18, 2007. (a) The Patrimonial State: A nation-state in which government leaders treat the state as their own piece of property. (b) The Predatory State: A nation-state in which government officials look upon the citizenry as prey for their rapacious greed. (c) The Shadow State: A nation-state that is generally characterized by informal political networks and a shadow national economy. (d) The Collapsed State: A nation-state in which common people are generally left to their own devices while government officials revel in conspicuous, state-financed luxury. (f) The Criminal State: A nation-state where the government is oblivious to crimes committed by government leaders and the elite, individuals with criminal records are appointed to positions of authority, and/or government leaders and the elite are engaged in criminal activities, such as money laundering, drug trafficking, human trafficking, or corrupt practices. Zambia is predominantly a “repressive state,” and mildly portrays some elements of the other kinds of nation-states. What do other Zambians think? The challenge for the Zambian government is to create what I may refer to as the “propitious state,” that is, a nation-state whose government embraces the following elements of good governance in both word and deed: accountability, transparency, rule of law, citizen participation, and a free press. By the way, it is meaningless to talk about Zambia becoming “the hub of Africa” as though such a status can be achieved merely through abracadabra without making massive investments in education and training, public health and sanitation, agriculture and food security, public infrastructure, and so forth. In fact, there is a need to periodically reduce taxes and interest rates in order to stimulate economic activity and job creation. Government revenue that would be lost through lower income and value-added taxes could be recouped through to be paid by ,new workers, and by abolishing the positions of Deputy Minister, District Commissioner and other locally based sinecures, as well as sinecures in foreign missions. An interesting piece in the UK Telegraph - Zambia's sea of plenty : Lake Kariba. Mr. Sakala noted that UNIP is the only political party with a rich historical background and needs to be protected from total collapse. He said the party should not be allowed to die as this would deny the new generation the chance to know why people sacrificed their lives for self rule adding that this would help them appreciate the importance of independence. What Edwin needs to realise is that death gives birth to new life. It is good for parties like UNIP to die, so that new parties with new ideas can emerge. Schumpeterian creative destruction is not only critical for capitalism but for the political process as well. Previous discussion : The Death of UNIP ? The Executive Board of the International Monetary Fund (IMF) today completed the third review of Zambia’s economic performance under the Poverty Reduction and Growth Facility (PRGF) arrangement. The completion of the review will enable the immediate disbursement of an amount equivalent to SDR 51.013 million (about US$ 81.2 million), bringing total disbursements to SDR 164.91 million (about US$ 262.5 million). The PRGF arrangement for Zambia in the amount of SDR 48.91 million (about US$79.2 million) was originally approved in June 2008 ( see Press Release No. 08/134), and later augmented by SDR171.185 million (about US$256.4 million) to SDR 220.095 million (about US$329.7 million) in May 2009 (see Press Release No. 09/147). The Executive Board today also concluded the 2009 Article IV consultation with Zambia. A Public Information Notice and the staff report will be published in due course. “The Zambian authorities are to be commended for their solid performance under the PRGF-supported program. Their prudent macroeconomic management was demonstrated by the Zambian economy’s resilience to the global economic crisis. “The 2010 budget is well balanced. The authorities aim to create fiscal space for poverty reducing expenditure and for infrastructure investment to sustain robust and diversified growth. The authorities will review tax policy and administration, with a view to broadening the tax base and reinforcing tax collection. The upward trend in the wage bill needs to be reversed to free resources for other priority outlays and social spending. Further reforms to enhance government spending efficiency are also needed. “Zambia’s risk of debt distress is low and there is some scope for external borrowing on non-concessional terms to finance the government’s share in essential infrastructure projects, particularly in electricity generation. The authorities plan to adopt a comprehensive debt management strategy, which will ensure that external borrowing is consistent with continued low risk of debt distress. The authorities are committed to improve aid management and to coordinate closely with donors. “The floating exchange rate regime and reserve money-based monetary program have served Zambia well. The authorities’ plans to transition to an inflation targeting regime should be premised on the establishment of the necessary preconditions. The authorities aim to implement the second phase of their financial sector development plan to enhance financial system stability and financial intermediation. “Attracting private sector investment in the electricity sector requires aligning tariffs with cost recovery levels. Efforts to strengthen the financial and operational efficiency of the state-owned electricity utility ZESCO should be accelerated,” added Mr. Portugal. An interesting report last week that government is renewing the quest to revise the current K268,000 minimum wage. The problem is that the current minimum wage falls significantly below the basic food basket. Any new minimum wage must have some real punch whilst ensuring it does not lead to negative effects. The question therefore becomes what should the living wage be? There are those of course who will always oppose any minimum wage e.g. here and here. Frederick Chiluba - love him or hate we cannot deny that this year he was successfully restored following his acquittal. Maxwell Nkole lost the trial of the decade that cost him his job. When all the chips were counted, it was found that under his watch the Task Force was corrupt and provided poor value for money. Cries of foul play did little to enhance his reputation. A man is supposed to raise his hand and say "I got it wrong". George Mpombo - By far the most influential politician in 2009. Following his unexpected resignation from government, he has continued to be a thorn in the side of Mr Banda. Ronnie Shikapwasha. His accusation that the Catholic Church was bent on causing genocide was one drop among many dangerous blunders. Undoubtedly, the defeat of MMD in Solwezi has turned out to be a huge moment in solidifying the strength of the Pact. We are now seeing real momentum building up. Post Editorials. We love and fiercely defend the independence of the Post, but I have found many of their editorials too boring to read. In 2010 we look for a variety in their presentations. The prosecution of Chansa Kabwela did irreparable damage to our international reputation. The nation became a laughing stock. The Government decision to abolish the Task Force on Corruption was right and proper. It was poor value for money and existed only to enrich the lawyers involved. William Banda as the Lusaka Province MMD Chairperson. On 25 October 1994, William Banda was deported to Malawi by the Fredrick Chiluba in a move condemned by international organisations including Amnesty International. Banda later told the Supreme Court that he was blindfolded and drugged, driven by Zambian Immigration Service and para-military police officers. He entered Malawi through Mchinji border post and later dumped at Lilongwe Police station. The JCTR have put out some important think pieces throughout the year ranging from politics to statistics. They continue to be head and shoulders above the rest. Finance Minister Musokotwane. Since his appointment Hon Musokotwane has failed to articulate a coherent economic vision for Zambia beyond pandering to mining companies and other foreign conglomerates. It is not too difficult to see that economic policy is not set in his office, but in the palaces of our mining masters that appears to hold him to ransom or is it their pockets? It is true Zambia weathered the economic storm but for that we have Magande to thank for initiating a process of broad based economic growth. Its gotta be Rupiah Banda with the State House Monkey. Enough of new parties! Already this year we have had four new parties, with another having started only to die within a month! I have no problems with people starting parties, but it is sad when such parties are merely surrogates for other parties. Indeed it is illegal under the Laws of Zambia. Too many to mention. But by far the biggest lie is one being perpetuated daily and which we have debunked. The lie is championed by Musokotwane and co is that the "variable profit tax does the same job as the windfall tax". This is the worst lie because it is costing our people a lot of money. His Royal Highness Chief Macha of Choma for exemplary traditional leadership which has now won him international fame. Among his accolades including the African Sanitation (African SA) Leadership Award following his outstanding commitment to promoting good sanitary standards in his chiefdom. A new thread for tracking the use of Constituency Development Funds (CDFs). This follows issues raised here. The CDF Committee in Kafue has handed over a police post to the Zambia Police Service in Mungu area. The police post was built at a cost of K48 million under CDF. More detail via this ZANIS article. The Zambia Alliance for Women continue the call for better access to land for women. A very important issue that goes beyond inequality. It strikes at the heart of the question on how the country can best ensure rural women are full players in development - some we touched we have previously touched on here. Aid for a non-existent policy. “I am pleased to announce that I have today approved a further programme of DFID support in the fight against corruption in Zambia. All of us, whether government, civil society, co-operating partner, or Zambian citizen, have a key role to play in resisting and combating corruption and ensuring that our resources are used for the purposes we intend,” said DFID head of the Zambia office Mike Hammond during the United Nations International anti-Corruption Day yesterday. The commission stated that this would also help civil society organisations so that Zambian citizens could be involved in anti-corruption initiatives. It stated that support would be given to parliamentarians so they could act more effectively in the fight against corruption. “The UK has been a strong supporter of the government of Zambia’s fight against corruption. Since the year 2000, DFID has already provided £8.4 million to the Anti Corruption Commission and the Task Force through the Anti Corruption Commission Enhancement Support (ACCES) project which finished earlier this year,” read the statement in part. Wasted money if you ask me because the NACP has largely been discredited by many observers. It is baffling why organisations like DfID spend money on policies that have no ownership among common people. Is there anyone outside State House who regard the NACP as a credible attempt to fight corruption? Perhaps more bizarre is that DfID has yet to justify what was really achieved in funding the Task Force on Corruption, which even the government has concluded was poor value for money and is now been investigated for corruption! Surely before you commit more money, the least one can do is check that money previously spent has worked. Times investigations revelaed that the workers concerned were those that worked for a Chinese-owned firm, Exploration Construction currently undertaking construction of LCM institutional facilities, who had complained of poor conditions of service. Investigations revealed that the workers were subjected to poor conditions of service by paying them low salaries and housing many of them in one house. Some of the workers interviewed at one of the contruction sites at the Director's Lodge and did not want to be mentioned said they were not happy with their conditions of service. They said management paid them as low as K180,000 per month while the highest paid worker went with K230,000 per month. "We sometimes get as low as K180,000 and these people expect us to live on that. Well-paid workers got K230,000 per month," one of the workers who pleaded anonymity said. The workers accused their Zambian supervisors of allegedly being unfair and behaving like their Chinese directors. The frustrated and disgruntled workers said once a worker was late or went to the hospital, management deducted K20,000 from the salary. One of the director's of Exploration Company, Ge Yi Lin said he had about 100 workers working on the construction of the LCM facilities. Mr Ge asked his Zambian interpreter how many they were in one house and the interpreter said 11. Mr Ge suggested that if the workers were still uncomfortable with the number that shared their houses, he would give workers K40,000 each so that they could find better accommodation for themselves. He could however, not respond as to whether K40,000 was enough for the workers to find better accommodation. "The long-term outlook for copper mining in Zambia is still very uncertain despite assurances by the government. Investors don't have sufficient confidence...To restore investor confidence, there is need to look at the laws, and that we haven't done yet... We still have people saying that when I come into power, I will chuck that one out ... investors are very sensitive to that..."
Its not just looking at the laws that matter, but how we look at the laws. I have previously noted that the current mining policy is doing nothing for building a lasting environment for growth because it has no full buy-in of all Zambians. Lack of consultation and unilateralism is hurting our country. We talk about "rule of law", but in my view right now there's no rule of law to break because government has acted without the people in this area. As long as that continue every government that comes along will constantly alter its mining policies because we lack transparency. We need a Zambian solution, not an MMD or PF-UPND solution. Mr Bantubonse and his friends have to realise its in their long term interests to push for transparency - deals made under the table are not sustainable. The approach should be consultative and transparent. 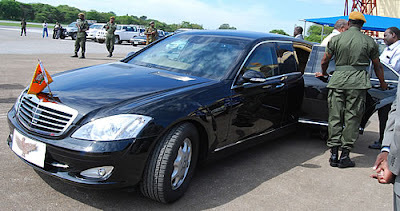 Anti-corruption commission spokesperson Timothy Moono said the arrest follows investigations the commission has been conducting in the manner the Government of the Republic of Zambia procured 100 hearses from Top Motors and 60 three-tonne trucks for the 'Keep Zambia Clean Campaign.' Liang was alleged to have corruptly offered K50 million and gave K15 million cash gratification to an ACC officer as inducement or reward for the officer to destroy evidence and quicken investigations which the commission was conducting in the procurement of the hearses and trucks. I have previously noted the corruption and mismanagement that is rife in our judicial system. Last week there was a report of imprest amounting to K398 million at Chipata High Court in Eastern Province that has not been retired for the last one year, according to internal audit reports. Aid for mineral exploration ? The Japanenese government announced last week that Japan Oil, Gas and Metals National Cooperation (JOGMEC) plans to work with the government to accurately map out areas which have mineral resources but not yet identified. Its not clear whether this will be funded by Japan, but it is certainly a welcome development. Atleast it might help avoid this. We'll return to the issue of exploration in our current "mining reflections". Apparently so. The life of Katele Kalumba, Kenneth Konga and the list goes on are clearly more valuable than ordinary Zambians. This is the message I get from reading this latest revelation that the duo are receiving special treatment on tax payers money. On purely moral grounds, sending political leaders abroad on tax payers money for special treatment is wrong for two reasons. First, it robs the poorest members of society valuable medical care. Money spent on Katele and others abroad is not free, it has an "opportunity cost". That money could be spent on saving hundred more lives within Zambia from curable diseases. Secondly, it sends the wrong message that long health is only a privilege of the few. The life expectancy in Zambia for males is below 35 years of age. The gentlemen in question are way above that age. The message appears to be that we care more about preserving the health of those older but rich than diverting the resources, say, to fight infant mortality. The economic argument is equally straightforward. Sending political leaders abroad distorts the incentives of our politicians to improve our health systems. The duo in question are not only abroad because our health system is weak, our health system is weak because we keep sending political leaders abroad. Let these political actors experience our poor health system, may be just may be, they may do something about it. President Banda addressing a Malaysian delegation which presented 11 Memorandums of Understanding (MoU) signed between institutions of learning in Malaysia and Zambia. One hopes we don’t burn up in smoke. With copper prices have now breached $7000, the only hot property in town is copper and those that control it. First report of the Committee on Estimates for the fourth session of the tenth national assembly appointed on 23rd September, 2009. In defence of mining companies.. The Times of Zambia had a total number of 54 election related stories in the period of the study. 59.3% (32/54) of the stories were about the MMD followed by the UPND with 22.7% (12/54).The least covered party was the Heritage Party with only 3.7% (2/54) of the total stories covered. The Newspaper had a total number of 24 stories that occupied the front page and 62.5% (15/24) on the MMD followed by both PF and UPND with 16.7% (4/24) a piece. The Heritage party had only 4.2% (1/2). The Times of Zambia had a total of 94 sources quoted for stories related to the October elections. The majority of the sources 76.6% (72/94) sources in the stories were from MMD followed by 12.8% (12/94) from the UPND. The Heritage Party had the least number of sources 2.1% (2/94). The paper had a total of 6 election lead stories and all of them 100% (6/6) were about the MMD. The Times of Zambia had a total number of 11 election related pictures. The MMD accounted for the majority of these pictures with 81.8% (9/11) followed by both the PF and HP with 9.1% each (1.11). The UPND did not have a single picture published. The majority of the stories that directly involved the presidential candidates were about Mr. Rupiah Banda with 50% (11/22) followed by Mr. Hakainde Hichilema with 36% (8/22). The paper did not carry any story that directly quoted Heritage Party president Brigadier General Godfrey Miyanda. The Daily Mail carried a total number of 30 election related news stories and the majority of them 63.3% (19/30) were about the MMD followed by PF with 26.7% (8/30). The least covered party was the HP with no story at all. The paper carried 22 front page stories about the elections and 63.6% (14/22) were about the MMD, followed by 27.3% (6/22) for the PF while the HP was the least with no front page story. A total number of 51 sources were quoted for the stories regarding the elections. The MMD had a huge number of sources quoted 76.5% (39/51) followed by the PF with 17.6% (9/51). The Daily Mail published 8 lead stories and all of them were about the MMD. A total of 19 pictures were published and the majority of them were about the MMD 52.6 per cent (10/19). The rest of the parties had 15.8 per cent (3/19) apiece. The Daily Mail published a total of 18 stories that directly quoted the presidential candidates. Mr. Rupiah Banda, Movement for Multiparty Democracy candidate had the most number of stories with 61 per cent (11/18) followed by Patriotic Front candidate Mr. Michael Sata with 28 per cent (5/18). Heritage Party candidate Brigadier General Miyanda was not covered directly. The Post Newspaper carried a total of 43 election stories and 41.9 per cent (18/43) were about the PF followed by the MMD with 34.9 per cent (15/43). The HP was the least with 2.3 per cent (2/43). The paper carried more stories about the MMD on its front page with 45 per cent (9/20) followed closely by the PF with 40 per cent (8/20). The Post did not publish any story about the Heritage on its front page from the copies sampled. A total number of 69 sources were quoted and 42 per cent (29/69) were MMD sources followed by the PF with 39.1 per cent (27/69). The Heritage party had the least number of sources quoted accounting only for 1.4 per cent (1/69). A total of 11 lead stories where published and the majority 63.6 per cent (7/11) were about the Patriotic Front followed by the MMD with 36.4 per cent (4/11). Both the United Party for National Development (UPND) and the Heritage Party did not have a lead story published about them. The Post Newspaper had a record number of 27 pictures published. The Patriotic Front had the largest number of pictures with 63.0 per cent (17/27) followed by the Movement for Multiparty Democracy with 25.9 per cent (7/27). A total of 20 stories published in the Post did directly involve the presidential candidates. Mr. Rupiah Banda of the MMD led with 40 per cent (8/20) followed by Mr. Michael Sata of the Patriotic Front with 30 percent (6/20), while Brigadier General Miyanda of the Heritage Party, and was the least candidate with the number of stories directly quoting him at 5 per cent (1/20). The Zambia National Broadcasting Corporation (ZNBC) aired a total of 40 news stories about the elections in the period of the study. The MMD accounted for 65.0 per cent (26/40) followed by the PF with 20.0 per cent (8/40) and the HP was the least party covered with only 2.5 per cent (1/20). The majority of the headline items from the bulletins analysed were about the MMD with 60.0 per cent (6/10) followed by the PF on 30 per cent (3/10). A total of 40 sources were quoted and the majority of them were MMD 65.0 per cent (26/40). The PF was next with 20.0 per cent (8/40) while the HP had the least number of sources quoted with 2.5 per cent (1/40). A total of 22 pictures were aired in the news items during the run up to the presidential elections and the majority of them involved the MMD 72.7 per cent (16/22) followed by the PF with 18.2 per cent (4/22). Mr. Rupiah Banda was the presidential candidate with the highest number of news items which directly quoted him, 58 per cent (11/19) followed by Mr. Michael Sata and Mr. Hakainde Hichilema with 21 per cent (4/11) a piece. The study also found that the private media in this case The Post Newspaper was very critical of the MMD candidate Mr. Rupiah Banda and the majority of the stories published about the MMD and Mr. Banda, in particular were negative. Quantitatively, one would get the impression that the MMD was well covered but qualitatively, that was not the case. Examples of negative stories about the MMD and Mr. Banda were noted in the stories published under the following headlines; “Squabbles Rock Rupiah’s Campaign Team” (08/10/2008), “Rupiah is Sleepy” (10/10/2008), “Banda Has Confirmed His Own Dented Image” (10/10/2008), “Another Eyewitness Insists Rupiah Bribed Sakala (10/10/2008), “Image Builders Cause Discomfort in MMD Campaign” (13/10/2008), “Rupiah Can’t Win Without Rigging – Hichilema” (20/10/2008), “MMD Doesn’t Deserve Another Chance to Rule – UPND Councillor” (20/10/2008), “It’s Over for Rupiah – Sata” (30/10/2008) and “CBU Students Vow to Vote Against Rupiah” (30/10/2008). Appeared on Diaspora Voice (hosted by James Mwape) earlier today to discuss mining policies in Zambia -you can listen to the show here. This part of an ongoing Zambian Economist / Diaspora Voice monthly forum to exchange ideas on the most pressing issues facing our country. Last month I discussed corruption - listen here. Next month (9 January 2010) we will look at Traditional Leadership & Development. A British company intends to invest an initial K235 bn ($51m) in Zambia's agriculture sector starting this year. Chayton Capital operating as CHOBE Agrivision Limited further plans to invest over K1.1 trillion in Zambia in the next five years. Commerce Minister, Felix Mutati, and Chayton Capital Executive Director, Karim Ola signed an Investment Promotion and Protection Agreement in Lusaka on Thursday. Mr. Mutati described the venture as the largest single investment in the agriculture sector in 2009. He said CHOBE agrivision which will venture in Wheat, Soya beans and maize production will employee more than 1,600 Zambians. The company will develop 10,000 hectares and is expected to produce 60,000 tonnes of wheat, 45,000 tonnes of maize and 15,000 tonnes of soya beans per year. And Ms. Ola said her firm will develop farms starting from Monze to Mkushi. She said Zambia is the first African country that is benefiting from Chayton Capital's business activities. She said the firm traditionally invests in emerging markets in Asia and Eastern Europe. CHOBE agrivision will become the largest agri-business in Zambia surpassing ZAMBEFF PLC. He observed that among the incentives further attracting investment is the reduced duty by the Zambian government on imports relating to agricultural machinery and the farming dividends and profits tax-exempt for the first 5 years of operation. Others are the 100 per cent tax allowance for outlay on land development, conservation and wear and tear allowance of 50 per cent for the first two years on machinery employed for agriculture. Mr Crowder further said the 50 per cent depreciation rate, allowing machinery to be written off also contributed to the company's financial investment in the Zambian economy. The "staged investment" must be seen in light of these incentives. It is quite possible that no more than $51m would be invested because with extent of the incentives would be sufficient for the company to recoup the profits and simply reinvest. In short to speak of additional $251m (or is it $241) is misleading because the $200 is presumably the excess profits they see making over the five year period, which they may reinvest. A detailed report by Thomas Sinkala on mining and the environment in Africa. Relevant to our discussion here. The question social scientists have unsuccessfully wrestled with for centuries is, Why? But the question they should have been asking is, How? Because inequality is not predetermined. Nations are not like children — they are not born rich or poor. Their governments make them that way. You can chart the search for a theory of inequality to the French political philosopher Montesquieu, who in the mid-eighteenth century came up with a very simple explanation: People in hot places are inherently lazy. Other no less sweeping explanations soon followed: Could it be that Max Weber's Protestant work ethic is the true driver of economic success? Or perhaps the richest countries are those that were former British colonies? Or maybe it's as simple as tracing which nations have the largest populations of European descent? The problem with all of these theories is that while they superficially fit some specific cases, others radically disprove them. It's the same with the theories put forth today. Economist Jeffrey Sachs, director of Columbia University's Earth Institute, attributes the relative success of nations to geography and weather: In the poorest parts of the world, he argues, nutrient-starved tropical soil makes agriculture a challenge, and tropical climates foment disease, particularly malaria. Perhaps if we were to fix these problems, teach the citizens of these nations better farming techniques, eliminate malaria, or at the very least equip them with artemisinin to fight this deadly disease, we could eliminate poverty. Or better yet, perhaps we just move these people and abandon their inhospitable land altogether. Jared Diamond, the famous ecologist and best-selling author, has a different theory: The origin of world inequality stems from the historical endowment of plant and animal species and the advancement of technology. In Diamond's telling, the cultures that first learned to plant crops were the first to learn how to use a plow, and thus were first to adopt other technologies, the engine of every successful economy. Perhaps then the solution to world inequality rests in technology — wiring the developing world with Internet and cell phones. And yet while Sachs and Diamond offer good insight into certain aspects of poverty, they share something in common with Montesquieu and others who followed: They ignore incentives. People need incentives to invest and prosper; they need to know that if they work hard, they can make money and actually keep that money. And the key to ensuring those incentives is sound institutions — the rule of law and security and a governing system that offers opportunities to achieve and innovate. That's what determines the haves from the have-nots — not geography or weather or technology or disease or ethnicity. On one side of the border fence, in Santa Cruz County, Arizona, the median household income is $30,000. A few feet away, it's $10,000. On one side, most of the teenagers are in public high school, and the majority of the adults are high school graduates. On the other side, few of the residents have gone to high school, let alone college. Those in Arizona enjoy relatively good health and Medicare for those over sixty-five, not to mention an efficient road network, electricity, telephone service, and a dependable sewage and public-health system. None of those things are a given across the border. There, the roads are bad, the infant-mortality rate high, electricity and phone service expensive and spotty. Nogales may be the most obvious example, but it's far from the only one. Take Singapore, a once-impoverished tropical island that became the richest nation in Asia after British colonialists enshrined property rights and encouraged trade. Or China, where decades of stagnation and famine were reversed only after Deng Xiaoping began introducing private-property rights in agriculture, and later in industry. Or Botswana, whose economy has flourished over the past forty years while the rest of Africa has withered, thanks to strong tribal institutions and farsighted nation building by its early elected leaders. Now look at the economic and political failures. You can begin in Sierra Leone, where a lack of functioning institutions and an overabundance of diamonds have fueled decades of civil war and strife and corruption that continue unchecked today. Or take communist North Korea, a geographical, ethnic, and cultural mirror of its capitalist neighbor to the south, yet ten times poorer. Or Egypt, cradle of one of the world's great civilizations yet stagnant economically ever since its colonization by the Ottomans and then the Europeans, only made worse by its post-independence governments, which have restricted all economic activities and markets. In fact, the theory can be used to shed light on the patterns of inequality for much of the world. The U. S. must not take a passive role in encouraging these types of movements. Our foreign policy should encourage them by punishing repressive regimes through trade embargoes and diplomacy. The days of supporting dictators because they bolster America's short-term foreign-policy goals, like our implicit support of Muhammad Zia-ul-Haq in Pakistan starting in the 1970s, and our illicit deals with Mobutu's kleptocratic regime in the Congo from 1965 to 1997, must end. Because the long-term consequences — entire nations of impoverished citizens, malnourished and hungry children, restive, discontented youngsters ripe to be drawn toward terrorism — are too costly. Today that means pushing countries such as Pakistan, Georgia, Saudi Arabia, Nigeria, and countless others in Africa toward greater transparency, more openness, and greater democracy, regardless of whether they are our short-term allies in the war on terror. At the microlevel, we can help foreign citizens by educating them and arming them with the modern tools of activism, most notably the Internet, and perhaps even encryption technology and cell-phone platforms that can evade firewalls and censorship put in place by repressive governments, such as those in China or Iran, that fear the power of information. There's no doubt that erasing global inequality, which has been with us for millennia and has expanded to unprecedented levels over the past century and a half, won't be easy. But by accepting the role of failed governments and institutions in causing poverty, we have a fighting chance of reversing it. An update to Mining Reflections : Proposition One, with new tax data as provided in a recent EAZ public debate presentation by Dr Mpande (UNZA, School of Mines). This shows conclusively that the mining revenue is in effect negative given the vast domestic VAT rebate (or the friendly term "exemption"). Excel form here. Trade Minister Felix Mutati has weighed in, making it clear that there would no tax rises for mining companies next year, despite IMF / World Bank calls to the contrary. In his words "You cannot just be playing around with taxation -- one year you do this, another year you do that". This is a poor argument and one Mr Mutati clearly did not accept earlier this year when his government abolished the windfall tax. The simple truth is that the current mining arrangement is not acceptable to ordinary Zambians. It therefore remains the case that unless we have a mining policy acceptable to ALL it will not stand the test of time. The mining companies should not delude themselves, the current fiscal arrangement is not sustainable. Caleb Fundanga appears to have caught the contagion, bizarrely sounding off that copper prices at $7,000 a tonne may not be good and he would rather see the prices stabilise around $5,000. Proposition One acknowledged that Zambia as a whole has seen little benefit from its vast mineral wealth. Proposition Two demonstrated that the picture looks worse when we focus on mining communities. We learnt that the overall impact on these mining towns is effectively negative given the huge uncompensated environmental and infrastructural carnage that foreign mining companies are wreaking in our nation. Under proposition three, we close the circle of impacts by focusing on the deplorable plight of our mining workers. But prior to that we must first deal with the 'why does it matter' question. Invariably, when talk of the poor deal that mining workers have been handed rears up, someone always contends that "it's better than nothing". Mining companies are creating jobs which these miners would never have had. Proposition Two briefly challenged that assertion. Here the focus is why we should care about how mining companies treat workers for moral, social and economic reasons. Human beings are endowed with moral worth as bestowed on us by the Creator. It is this "bestowed worth" that causes each of us to care about how others are treated whether those individuals are being paid to do that vocation or not. We care that in that job they are treated right by their employer. We can extend this argument in two ways. First, the government has through legislation bestowed rights and responsibilities for both mining employers and employees. When investors violate these responsibilities through negligence, as citizens we expect the government to take corrective action. Secondly, the current plight of mining workers may well be the fault of the Zambian government and by extension the Zambian people who put the government there. The bungled privatisation process of the 1990s left many of our workers impoverished and without protection before new investors. In recent years of course the mining companies treatment of its workers has brought significant damage to our international reputation. Zambia has often been cast as a country exploited by foreign investors and its people as either extremely ignorant of how to secure a win-win situation or exploited by those in power in collusion with mining investors. Like most extremes the truth probably lies in between somewhere, but in the modern age of the Internet and fast spreading information, such damage to our reputation are hard to rebuild. There's no long term advantage in being cast as a nation that bows its knees to any new investor at the expense of its people. The other dimension is social cohesion. Where workers are being treated poorly, it wont be long before strikes and demonstrations occur. People start feeling prisoners in their own country and begin to agitate for change. Economic arrangements that do not enforce social stability often leads to social implosion. For this reason even if we don't care about mining workers per se, we should recognise that how they relate to their employers is just as our business, as much as its theirs. More specifically, social unrest raises the spectre of costs associated with keeping a lid on such things when it all comes to the boil. Such costs are usually borne by our justice system (police, courts, etc). There are other economic costs associated with the poor plight of mining workers. These include health costs, wider negative impacts of social break down, political instability, etc. All of these costs are usually borne by ordinary Zambians. Given the aforementioned reasons, it's imperative to ensure that workers have a prosperous, safe and secure working environment. Their problem is ultimately our problem. Unfortunately this is not the case, many politicians, and sadly ordinary Zambians, ignore the abuse of our mining workers. A number of issues lends credence to this troubling conclusion. The poor safety practice of mining companies. Thomas Mumba loved to sing in the church choir and dreamt of recording a CD of gospel music. At 23 he did not drink or smoke. He preferred to spend his time worshipping God. Thomas was also the only bread winner in his family. Today Thomas lies buried along 45 workmates following a blast at a subsidiary mine in Chambishi three years ago. His mother Justina Mumba best reflects the sentiments of many : "They came to make profit, not to look after the lives of the people who were giving them profit". The Chambishi incident brought to the surface what everyone knew. The safety records our new masters is extremely appalling, especially for Chinese firms. A large contributor to the poor safety environment is casualisation - the situation in a which a dual labour market develops : a core of permanent workers with a periphery of workers on fixed - term contracts, or contracted as self-employed individuals. Casualisation diminishes safety in two ways. First, it provides the employer the incentive to undertake dangerous and reckless mining activities because the contracted labour is not fully tied to the mining company. The expected cost to the employer when something goes wrong is therefore diminished. With a large pool of unemployed labour in Zambia, casualisation has found a natural home in mining companies. Secondly, casual labour by its nature is less tied to the firm and therefore has minimal incentive to undertake mining activities that are safe for all employees in the long term. The most common accident in the mines is "rock fall". These usually happens by casual labourers going mad developing [digging new seams] and leaving people exposed without support in roof sheets. Most of the development work in mining is done by casual labourers. Casualisation of course has another impact on mining employees - it has led to poor wages. This has occurred through two complementary routes. The opportunity to have casual workers has provided an incentive to mining companies to get rid of contracted workers and hire casual employees. This has often led to reduction in contracted workers and reduced their bargaining power. Mining union power is being eroded as casualisation amplifies - the wages of contracted workers have therefore remained stagnant. The other impact is that casualisation has reduced the opportunities for long term contracted work. With this in mind we can confidently assert that the quality of employment from additional mining investment is generally poor. Finally, there's the question of labour rights. This is particularly pertinent for many employees of Chinese mining companies who are known to have been denied union rights. Their conditions are probably worse than for those working for Canadian, Swiss or South African multinationals. These issues taken together present a potent challenge to the likes of President Banda who speak joyously of the benefits of reducing mining taxation in exchange for new jobs. We are surely in order to ask - of what quality? Our mining workers can now be added to the list of losers from the current mining policy, alongside mining communities and the country as a whole. The question then is, who is benefiting? Next stop - Proposition Four. ZANIS reports the Nkanddabwe Chinese Collum Coal Mine (CCM) Workers have gone on strike demanding for improved condition of service and improving safety at the mine in Sinazongwe district in Southern Province. According to the Ward Councillor Partson Manguje and the CCM Director Xu Zian Rui the workers blocked the road leading to the mine and threw missiles at the Chinese managers. The workers are apparently getting a salaries in the range of K200, 000 - K500, 000 per month. A situation the Councillor describes as getting "slave wages [which ] have incensed the workers who were unable to feed their families from the meager salaries". The PF President Michael Sata touches on the poor deal of mining workers. I recently read an article entitled “Government Urges Local Scientists to Be More Competitive” which appeared on Lusaka Times (LT) of December 2, 2009. In the article, Science and Technology Minister Gabriel Namulambe was reported as having toured government-funded projects at the Technology Development Advisory Unit (TDAU) at the University of Zambia. Technological inventions and innovations are of immense value to any given society. We, for example, know very well that the affluence being enjoyed in such countries as Canada, Japan, Great Britain, and the United States today is the direct outcome of a relentless quest for new and improved forms of technology in agriculture, agribusiness, commerce, and the manufacturing industries by individuals and institutions in such countries. (l) Lack of, or inadequate, political will and commitment to the advancement of scientific and technological know-how. There are many practical ways and means by which the Zambian government and business institutions can stimulate the supply of, and/or the demand for, new forms of technology, such as the following: (a) addressing the needs of formal education; (b) designing research and study programs that are consistent with the needs of society; (c) adequately supporting R&D activities; (d) fostering innovation and creativity in commerce and industry through tax and other kinds of incentives; (e) generation of a suitable population policy designed to increase the size of the local market through population growth; (f) engaging in multilateral S&T initiatives with technologically advanced countries; and (g) keen governmental leadership. Getting rid of sinecures in government, among other things, can release financial and material resources for investment in science and technology. Government should reduce its share holding in, or completely privatise, the Times of Zambia, the Zambia Daily Mail and the Zambia National Broadcasting Corporation in order to guarantee neutrality.